If someone showed me this image and asked me where these throw pillows are from.. I'd probably say Crate & Barrel. Guess where they are from? IKEA! I found myself browsing the IKEA pillow selection and was very pleasantly surprised. 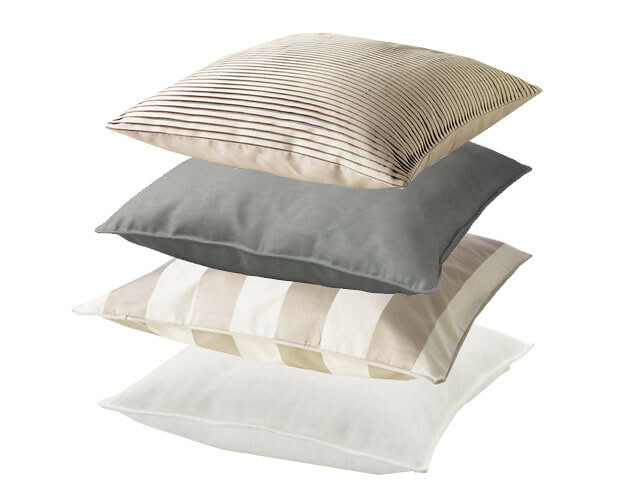 These four pillows create a soft, pretty mix of (faux) silk, linen and cotton. Perfect for a neutral nelly room. All covers range from $6 to $15 (!!!). IKEA also has feather inserts for only $7 (!!!). I'm always an advocate of beautiful designer fabric pillows (they can really change a room), but these four pillows are pretty great. They look much more expensive than they really are! Really pretty! I'm actually heading out there in a couple of minutes. I will have to check them out in person. So excited to be seeing you in a couple of days. Need to email you with my cell phone so we can find each other at High Point. Oooh! Great find. I'm a big fan of buying inexpensive pillows in different colors and textures so that I can decide what look I really love (and it takes me a loooong time and many tries because I'm a major commitment phobe) before I spend the money on custom, designer ones. I'm ready to plunge into some silk options...these are fabulous choices. Just so happens I have to go to Ikea this morning to get a few things for my shelter room....will have to check them out!